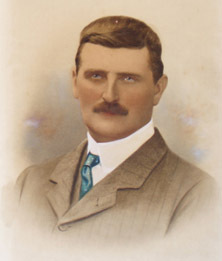 Holman Fred Stephens (1868-1931) is remembered for his involvement in the engineering and management of a collection of minor railways, which he ran – in an eccentric and autocratic style – from his office in Tonbridge. After briefly studying engineering at University College, London, Stephens became a pupil of the Locomotive Superintendent of the Metropolitan Railway before moving on to gain experience of civil engineering. A first position as Resident Engineer on the Paddock Wood to Hawkhurst line (opened in 1893) led gradually to involvement in other projects in the same area. In 1895 he rented rooms for home and office at Ashby House, No. 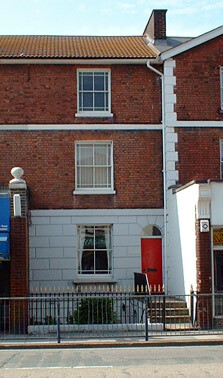 1 Priory Road, Tonbridge, adjacent to Quarry Hill Road. As his practice grew he set up the office on the opposite side of Quarry Hill Road at 23 Salford Terrace, in 1900. These two premises served Stephens for the rest of his life. Stephens was a long-term member of the Territorial Army (as it became), having reached the rank of Major by 1914. He served in the Royal Engineers until 1916 when he returned to civilian railway work with the rank of Lieutenant Colonel – a title he continued to use thereafter. All of the Colonel Stephens railways have now closed, with the exception of one in Devon, though several – including the Tenterden to Bodiam stretch of the Kent and East Sussex Railway – have subsequently been reopened by enthusiasts. In Tonbridge, the Priory Road site later became Rawson’s Garage and is now flats. The Salford Road premises remain largely unchanged externally. Furniture and other items from it are displayed in the Colonel Stephens Railway Museum at Tenterden. One of the ventures Stephens was associated with, though it never came to fruition, was the proposed Hadlow Light Railway. This would have run from a station in the Tonbridge east goods yard (now car park) in Vale Road, through the Angel Centre site, across Botany at a level crossing, then over the Medway and the flood plain to a North Tonbridge station in Hadlow Road. It then followed the route of the A26 to Hadlow Junction, from which one branch would have gone north to Plaxtol and Basted while the other led east to Yalding. Holman Stephens never married. He died in a Dover Hotel in 1931 and is buried in London at Brompton Cemetery. A Colonel Stephens Society was set up in 1985.